Everest is producing the Multi wash machines all in house with 2, 3, 4 or more tanks also to request of customers special machines are produced. 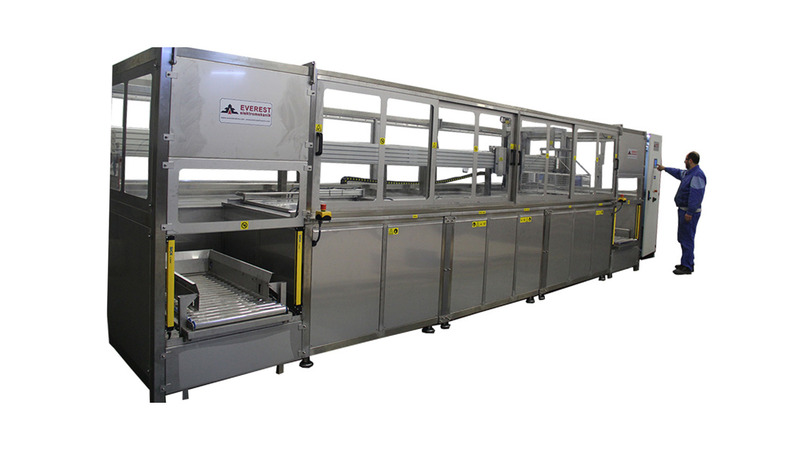 Mainly working on customer requests and special machines we also have our standard range which contains prewash, ultrasonic cleaning, rinsing, passivation and drying, two or more are used in a combination. Our progresses are as following. On greasy materials and very dirty materials before ultrasonic cleaning you can choose an prewash progress which helps cleaning the parts better and saving from the chemical also time. We add this progress on request. This is the progress which the cleaning is done complete. Ultrasonic power is the energy changing electric power to sound waves. With ultrasonic power we reach the points where its impossible to clean, like small holes and complicated parts which can&apos;t be cleaned with brush or hand. Using chemicals for cleaning the parts have trace of chemicals after cleaning. To clean the parts from chemicals we use a rinsing progress, this progress can be circulated to the system, can be used longer or shorter depending the time requested. If the material is wanted to protected against rust or if it&apos;s going to be shelved for a long time there can be an other tank added for passivation chemical, where the material can be passivated against these factors. If the cleaned material is wanted to be dried, a fan or hot air added to dry the material. Oil Skimmer, Circulation, Filtration, Air Blast, Carrier system, Pneumatic lid, are the optional parts to be added on request.